A bounty of 10,000 euros (£8,200) is being offered to catch the people who took the online multiplayer game Wurm offline. The game's servers were victim of a distributed denial of service (DDoS) attack this week and the game remains offline. A DDoS attack forces a website offline by overloading the site's servers with more data than it can process. The bounty is being offered for any "tips leading to a conviction". 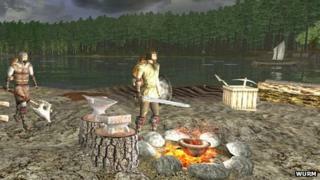 Wurm is a massively multiplayer online role-playing game (MMORPG) that is played on personal computers. The game takes place in virtual realms and everything in it is created by the players who are taking part. They can compete against each other or combine forces to defend a realm. The attack happened just after an update to the game. Writing on Wurm's website, one of its creators said it would be back online as soon as possible. "We were the target of a DDoS attack and our hosting provider had to pull us off the grid for now. "We will be back as soon as possible, but things are out of our hands since their other customers are affected. "We can offer 10,000 euros for any tips or evidence leading to a conviction of the person responsible for this attack," he wrote. People writing on the site's forum did not think the attackers would be easy to catch. One user suggested it could be a disgruntled player but equally could be somebody "completely random". They also pointed out that DDoS attacks "are a daily event that run into the hundreds". Players were reassured that any progress they had made before the attack would not be lost. Barry Shteiman, of data security company Imperva, said the nature of attacks on online gaming websites had changed. "It is unfortunate that Wurm got hit by a DDoS, especially on the day of an update. "If we take a look at last year's gaming attacks, we can definitely see that there was a focus on account hijacking rather than service disruption. This is therefore a new trend that should be watched out for. The company had already planned to move the hosting of the game to new servers and because of the attack has now speeded up that process. In its latest statement, the company said it was unsure when the game would be back online although "things are looking good".